An allegorical take on the nature of blind faith, Bezalel Academy graduate Nadav Nachmany’s latest animation The Swamp King questions our willingness to lose our identity to and idolize those we falsely elevate, even as they’re perceived wisdom is ultimately revealed to be nothing more than hot air. 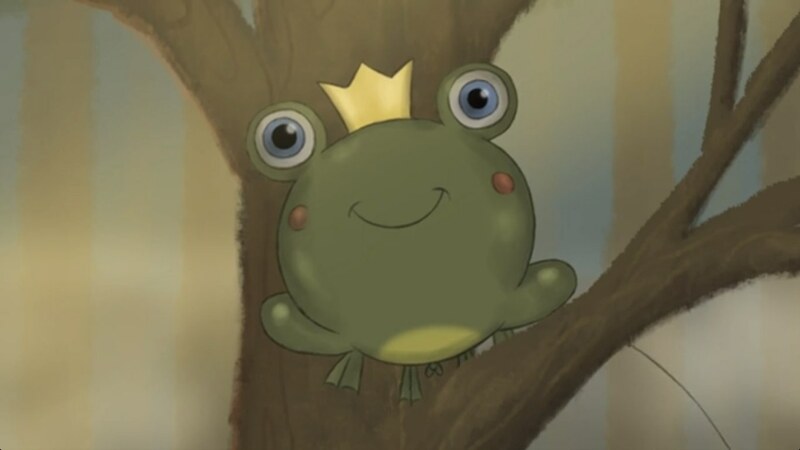 Nadav talks to DN about transposing a classic Judaism story into a tale about misguided frogs and how The Swamp King developed from its initial beginnings as a 1 minute competition entry completed in 5 days into a two year labour of love. This is actually your second telling of The Swamp King. What was the the initial iteration of the film and how does this version build on the original? Two years ago I made a short film for the Maratoon competition. The concept of the competition is that you have to make a film in just 5 days, so to make sure people don’t cheat, they usually reveal a few words on the launch day of the competition that you have to use in the film. That year they tried something new and gave us a Polish poem called Onion; it talks about how an onion is a round perfect symbol and yet when you remove the layers you see there is nothing inside. Most of the competitors just made a film about an onion but we were trying to go with a much more metaphorical interpretation. We initially started working on something completely different and worked all night to create an animatic, but then in the morning we felt it wasn’t working and started talking about something else. We wanted to explore the concept of idol worship, it reminded me an old tale we know in Judaism about Avraham. The tale talks about a time where the entire world was worshipping stones and idols, Avraham’s father was a big idol worshipper and he had a big store filled with idols. Avraham was the first man to recognise that the world comes from the unity of one energy source, and he knew that it didn’t make sense to believe that any kind of wealth could come from an idol you made yourself. So when his father leaves one day he smashes the whole store with a bat except for one idol and places the bat in the hand of that idol. When his father comes home he sees all the destruction and asks his son what happened and he answers that the big idol in the corner did it. The father was angry, saying “Do you really think I believe that he could have done that? He is a stone!” Avraham replied, “You don’t believe he can do that and yet you believe that he can create the world and bring you wealth?” His father got the message and left idol worshiping, and Avraham went on a journey spreading the word of his faith. So anyway we were talking about that whole concept, liked it and wanted to use that theme. We kinda got thrown into a scene where little frogs encounter a balloon and think it’s a god, and we were trying to imagine what would happen. We also thought that we could do it fast cause we could duplicate the frogs. So we finished the film but it didn’t win. I felt that we kinda missed it and I wanted to make it better so I decided to take some time and work on a few shots and fix them. What actually happened was I got a bit carried away and kept pushing it further, kept replacing shots and adding new ones, and it became a different movie but with the same theme. Did your approach to production change once you no longer had to work within a 5 day production limit? It was a very different work process because I wasn’t working on a script and when it was ready I just started animating, but it was more like building on ruins so it was much harder. The film was hand drawn on a graphics tablet using TVPaint for the animation, Photoshop for the background paintings, and After Effects and Premiere for compositing and editing. The music was made by an Israeli composer named Rea meir, who worked with me to give the film an African tribe feel. I kept trying to save time by using elements and shots that I already had, but it was really difficult because it didn’t allow me to be free and make sure that everything worked, I had these crutches and had to walk with them. Looking back I would throw the last film out and start it fresh. It was also very hard to work on something in between projects. I would leave it for a month or two then go back to it, and every time I saw something else that I wanted to change. I had to invest a lot of time and money to make it happen, and it took me over two years to complete. The majority of your animations are dialogue free. Do you prefer to tell stories solely through images, sound effects and music? Yes, most of my films have no dialogue, but not through choice, I really want to start making more films with dialogue. I think words are such a powerful tool but when I was learning at the Bezalel they encouraged us to tell a story without using words. Most of the films that are being made there are dialogue free, as were the films we learnt about. And of course when you want to complete a short film in a very limited time dialogue can make the process much harder. My graduate film Moving Pictures was supposed to be a musical with singing but we thought it would be too hard to finish in a year so we went in a different direction. It’s usually a question of time and money, but if I could, I would make sure all of my films were be bigger, with more dialogue and maybe even musical elements. Have you got any future film plans you can share with us? Currently I’m working on a few projects as a freelancer, but I also have a few independent projects in development. Last year I made a parody about a Jewish samurai called Samurai Jew and now I’m working on the next episode, which I’m actually currently running a Crowdfunding campaign for. In the future I would really like to do more collaboration with more artists and work as a group. Working by yourself can give you a lot of freedom but as someone once said, “working alone can get you faster, but working together can bring you further”. After a few years of working mostly alone I can really relate to that and besides it’s always more fun to work with more people. I want to do more writing, maybe try live action, but my biggest dream is to write and direct an animated feature film that will be special, different and will inspire and touch people’s lives.